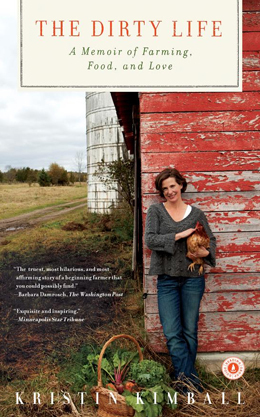 The Dirty Life: A Memoir of Farming, Food, and Love by Kristin Kimball (Scribner, New York, New York, 2011). The Dirty Life is Kristin Kimball’s story of discovering the two loves of her life – the love for her future husband, Mark, who she meets while on a journalism assignment, and the love for organic farming, which she unearthed as the couple began to farm together in Essex County in upstate New York. It’s not an easy life, but it’s one that calls to the deepest parts of them. Driven by Mark’s idealism and determination, the couple develops a plan to offer a full-diet, year-round CSA, providing not just vegetables, but eggs, grains and flours, herbs, maple syrup, meat – beef, pork and chicken — and dairy for their subscribers. They eschew the use of pesticides, herbicides and fertilizers, feed their cows grass and milk them by hand. One interesting passage describes the different flavors milk can have, depending on what the dairy cows’ diet was made up of. 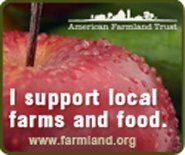 It reminded me of Barbara Kingsolver’s description of the difference between store-bought tomatoes and locally-grown tomatoes in her book, Animal, Vegetable, Miracle. As much as the book is about farming – the process and hard work of growing food – it’s also about the food itself. The book is peppered with descriptions of sumptuous meals made with organic ingredients: kale with poached eggs, deer liver with homemade bread and a fresh salad, icefish chowder, dandelion greens in winter, the first Thanksgiving dinner Mark makes for Kristin’s family. Kimball’s story is also about the transformative power of the land. She goes from a somewhat fit 30-something writer to a gritty farmer, scraping by financially, learning to make butter and cheese, raise, feed and slaughter animals, drive draft horses, and fix things around the farm. Like her relationship with Mark, the journey is not always smooth, but it is (eventually) vastly rewarding. Spoiler alert: The Essex Farm is still in business. At the time the book was written, Kimball and her husband fed 100 people. Today, according to Kimball’s website, they have 222 subscribers and the farm has grown to 600 acres. They have 15 solar panels, nine draft horses, 10 full-time farmers and three tractors. In 2014, the membership cost $3700 per year for the first adult, $3300 for the second adult, with a $400 discount for each additional adult. Children over 3 are $120 per year of age. Every member of a household must be a member. You can read more about Kristin Kimball and the Essex Farm at www.kristinkimball.com/.